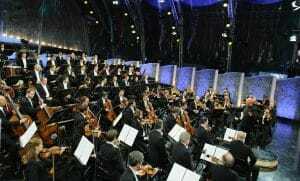 Led for the second time by German pianist and conductor Christoph Eschenbach, the world-renowned Vienna Philharmonic returns for its 14th open-air concert, with a program inspired by fairy tales and myths, in Austria’s Imperial Schönbrunn Palace Gardens. Fairy tales, myths, legends, and sagas are closely entwined with many composers and compositions. They have served as inspiration, models, and sources for many musical works, several of which have been selected for this concert. Some are new and some are old; some are German, Bohemian, and Russian; some are based on literary models and one is a composer’s opinion about a myth. The concert soloist is renowned soprano Renée Fleming, who performs two arias from operas by Antonin Dvořák, as well as three songs by Sergei Rachmaninoff. Also included in the concert are works from Sleeping Beauty, Hansel and Gretel, the Harry Potter films, and more. On CPTV: Friday, August 18 at 11 p.m.